Pretzels: hands-down, a top-5 snack food. So simple, so good, so surprisingly versatile (just ask Auntie Anne). For me, pretzels get really interesting when you think of them as an ingredient, as the start of something, rather than the end of it. I’ve posted a pretzel-transformation recipe before, and I wasn’t surprised to discover that other bloggers had the same idea. Adrianna from A Cozy Kitchen has got a real knack with pretzels, as evidenced by these insane pancakes. And Molly from My Name is Yeh‘s pretzel shortbread cookies looked so good, I barely changed anything in the riff I’m sharing with you today–just a slight tweak in ingredients and process. 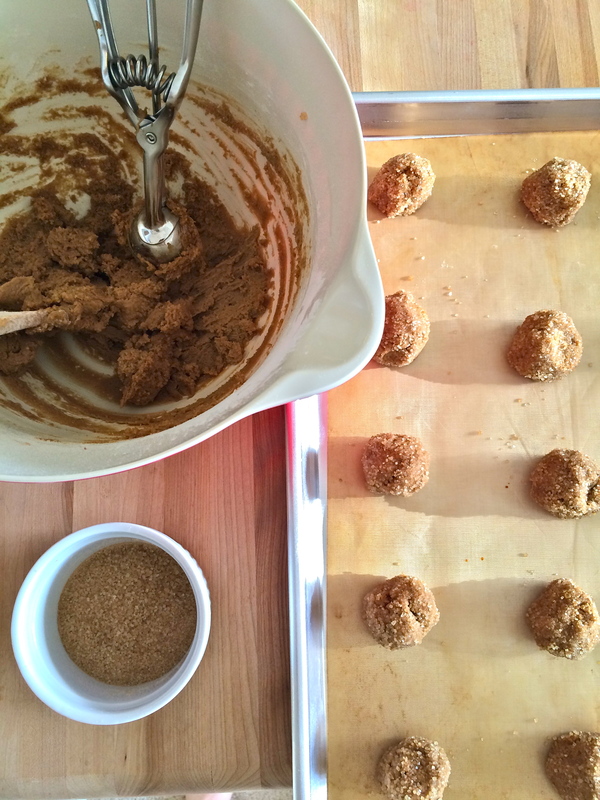 But it’s an important change, where I sub in one of my all-time favorite ingredients besides pretzels: brown sugar. Damn. Enjoy. 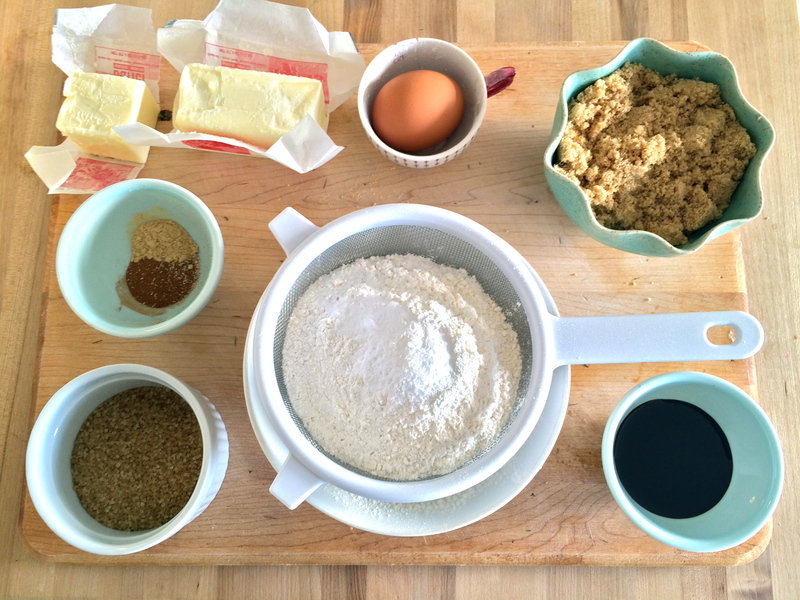 In a mixing bowl, cream together the butter and brown sugar. Stir the pretzel flour and all-purpose flour into the butter mixture. Eat a tiny bite of the batter, because it’s sooooo good. Press the somewhat crumbly batter into whatever pan you’re using (I used what I think of as a “brownie pan”) so that it’s evenly packed. 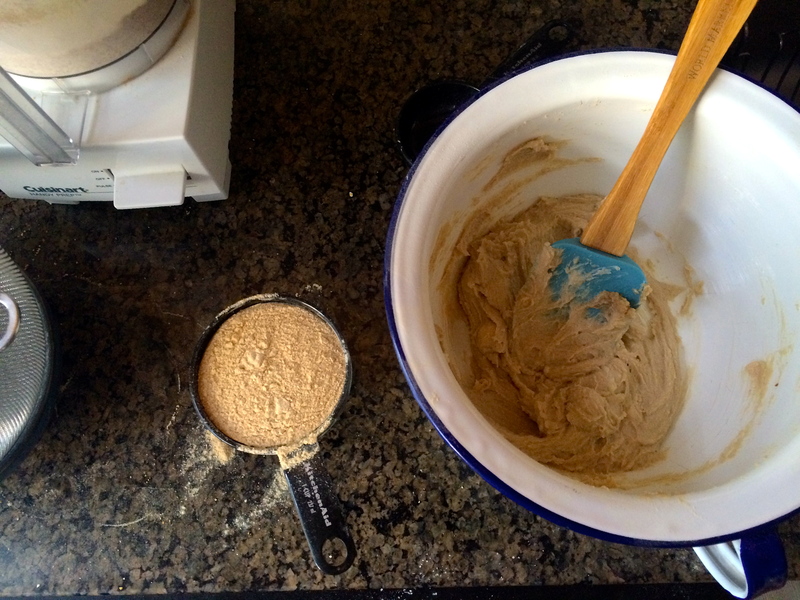 Then, use a knife to cut the batter into bars. Do this before you bake, because if you try to cut them after baking, you’ll probably end up with a pan full of crumbs. Poke a few holes in the tops of the bars with a fork (make a pattern if you’re feeling cute). Bake for 25-35 minutes, until just starting to brown. Savor the scent of your kitchen…it will smell divine. When the bars are done baking, remove from the oven and let cool in the pan for 5 minutes. Use a knife to retrace the lines you cut before the bars baked; it should be easy to do. Let cool completely in the pan. Once the bars are cool, melt the chocolate chips and oil together in a small bowl. I popped them in the microwave for about 40 seconds, stirring halfway through, but you can use a double boiler if you’re fancy. 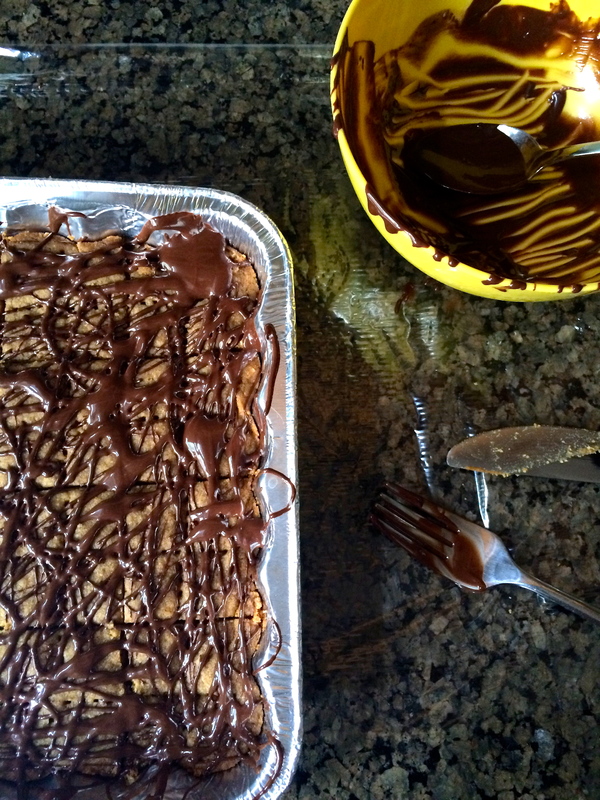 Take a spoon and drizzle the chocolate in whatever pattern you want. I went for free-form marble and I’m pretty happy with it. Let the chocolate set. That’s it! Enjoy the salty-savory-sweetness. Whenever I visit my cousins in Denver, we do A LOT of cooking and baking together. I’ve been here for 3 days and we’ve already made so many good things. I wish I had photographed our dinner a few nights ago, elote chicken salad, but I spaced. I did manage to write down the recipe, though, so it’ll make it up on the blog someday. 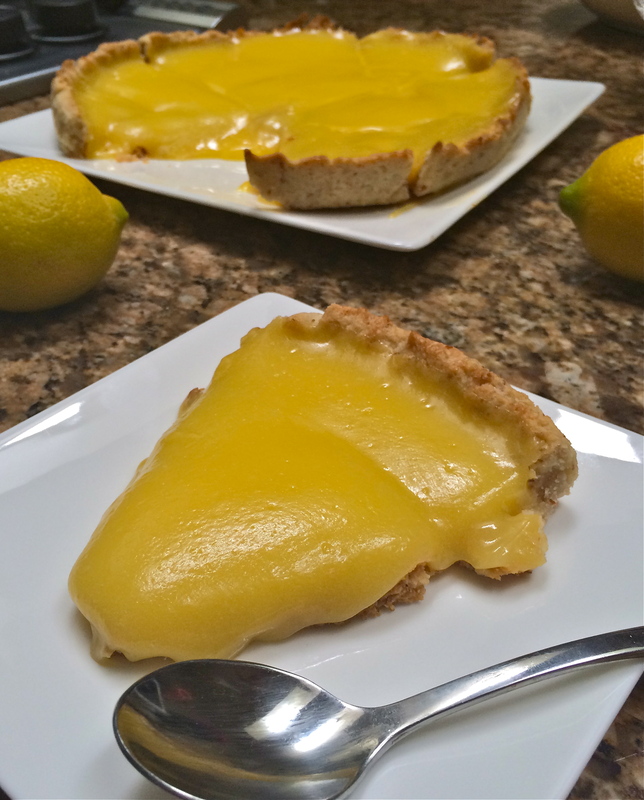 This afternoon, we wanted something sweet and tart, and lemon curd came to mind right away. 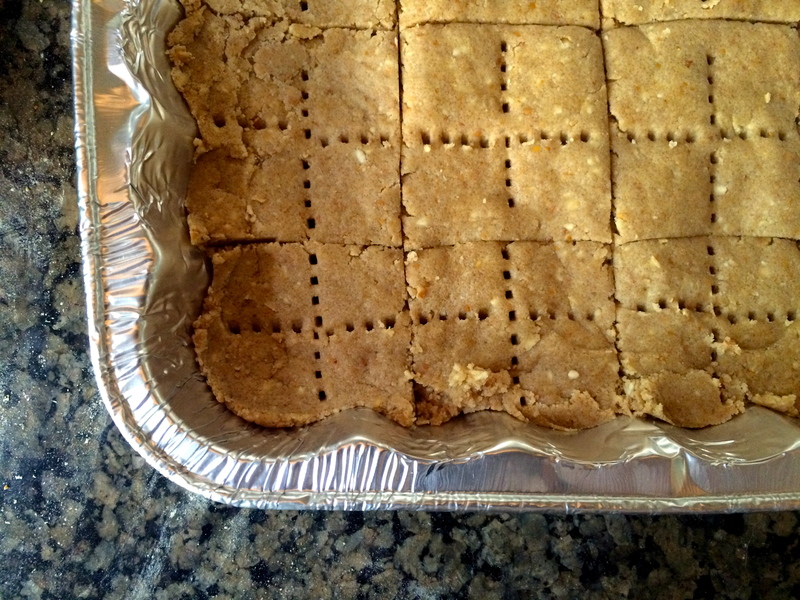 This recipe is a team effort between my cousin Summit and me; she made the shortbread crust and I made the curd. The curd is exactly what you’d expect: tart, sweet, deliciously lemony. And the crust was a nice surprise, a bit denser than we thought it would be but still a really nice shortbread (it was everyone’s favorite part!). A warning for those who try this recipe themselves: as soon as our tart came out of the fridge, a feeding frenzy ensued. Be prepared. Start with the curd. Cream the butter and sugar until light and fluffy. One at a time, add the eggs and then the yolks, stirring to incorporate between each addition. Once all the eggs are incorporated, stir another minute or two until creamy and smooth. Then, add the lemon juice and stir. Don’t freak if everything is separated and curdled-looking! You’re doing it right. 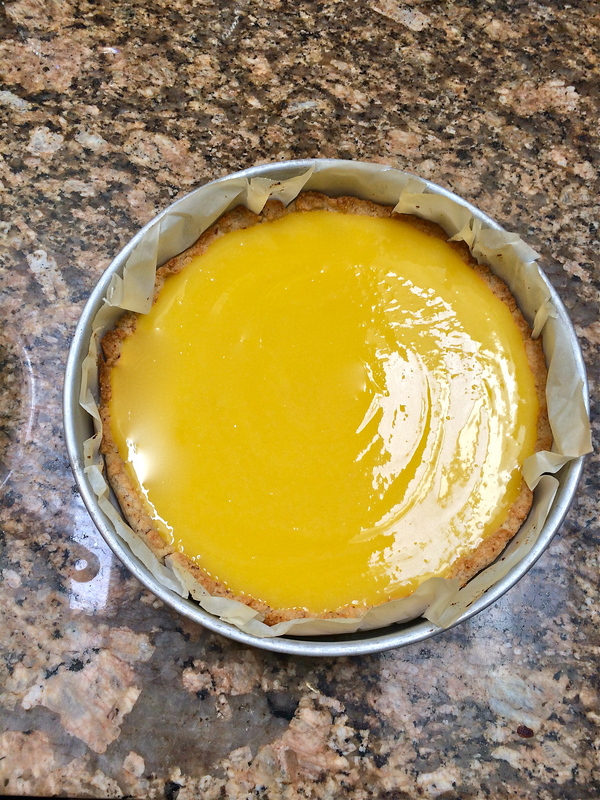 At this point, I started the tart shell. Stir together the ground almonds, flour, and sugar. Then, use a fork or pastry cutter to cut the butter into the dry ingredients, until the mixture resembles slightly clumpy sand. Add the water one tablespoon at a time–you want to use as little water as possible to hold the dough together. Once it holds without crumbling too much, transfer it to whatever you’re using to bake the tart. We used a cake pan lined with parchment paper, but this would be adorable in a traditional tart pan, too. Press the dough into the pan and then refrigerate for at least an hour. While the tart shell refrigerates, cook the curd. 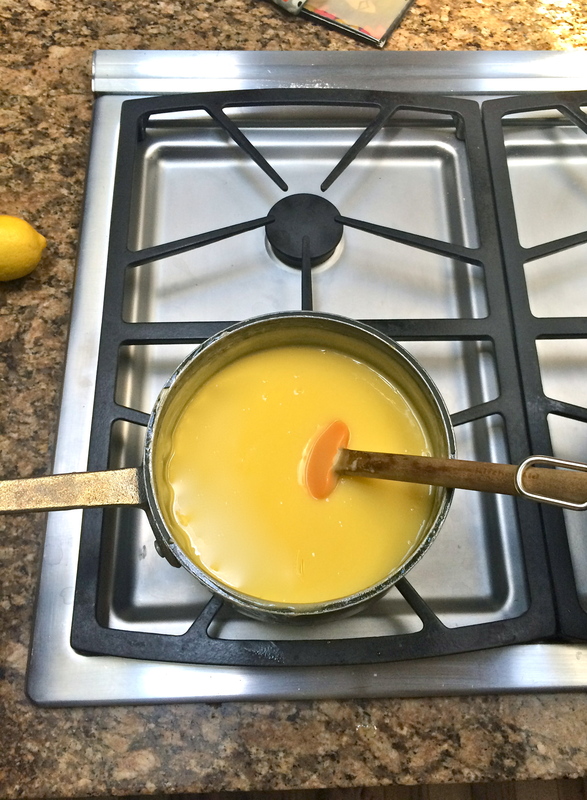 Pour the lemony mixture into a saucepan and heat over low, stirring occasionally, until the curd is heated through and the mixture is uniform (i.e., no separation). Now, turn the heat up to medium and stir constantly for about 10 minutes, until the curd is thickened and beautifully glossy. Turn off the heat and transfer the curd to a bowl. Press plastic wrap right onto the top of the curd (this prevents a gross skin from forming on top) and let it cool to room temperature. Then, move it to the fridge to cool all the way. Back to the tart shell. When you’re ready to bake, preheat your oven to 400 F and use a fork to poke a few holes in the base. Ideally, you’d set baking weights or dry beans inside the shell on a layer or parchment, to weight it down while it cooks and keep its nice shape, but we didn’t have this and obviously everyone survived. If you’re using weights, bake with weights for 8 minutes, remove the weights, and finish for about 10 minutes. If you’re going naked (without weights) like we did, just bake for about 15 or so minutes until the shell is set and browning. Let it cool. Okay, the final step is assembly. Take your cooled tart shell and your beautiful cooled lemon curd. Pour the lemon curd into the shell. Smooth the top. And if you can bear to wait, it’s probably a good idea to refrigerate for another hour or so, now that everything’s assembled. But if you can’t wait to dig in, that’s okay, no one’s judging. Once it’s cooled and fully set, you’re good to go. I definitely recommend serving this with whipped cream or ice cream. Keep refrigerated so the curd holds together nicely. Yum. And thanks for being my co-baker, Summit! Crazy to think it’s been over 4 months since I’ve posted a recipe. I still cook and bake all the time, but my weekend days (when I tend to test out new recipes, and when there’s nice daylight for photos) are not about the blog right now. Instead, I now spend at least one day of my weekend volunteering at a local dog shelter. I started volunteering last spring, but lately it’s become a huge priority for me. It’s so rewarding and special – I encourage anyone who’s interested to start volunteering at an animal shelter near you, because I can promise you they need the help!! Meanwhile, I’m exhausted from work travel this week, so I decided to take the day off from the shelter and bake these cookies. 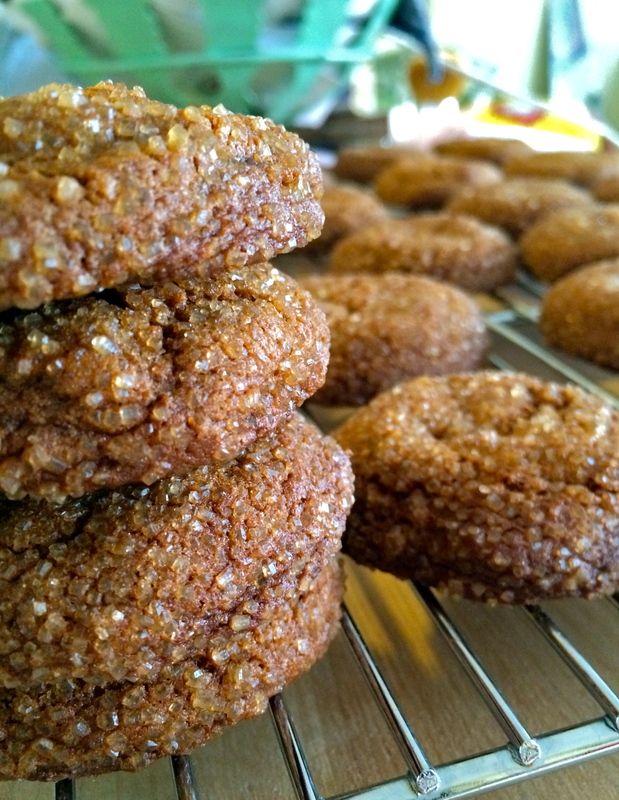 Adapted from a recipe by Joy the Baker, they smell amazing and taste even better. And I’ll still get my pup time in – it’s a three-day weekend for MLK Day, so I’ll get to spend all of Monday with them! Cream together butter, brown sugar, cinnamon, ginger, and nutmeg until the mixture is fluffy in texture and light brown in color. Add the egg and molasses and stir just evenly combined. Then sift in the flour, baking soda, and salt. 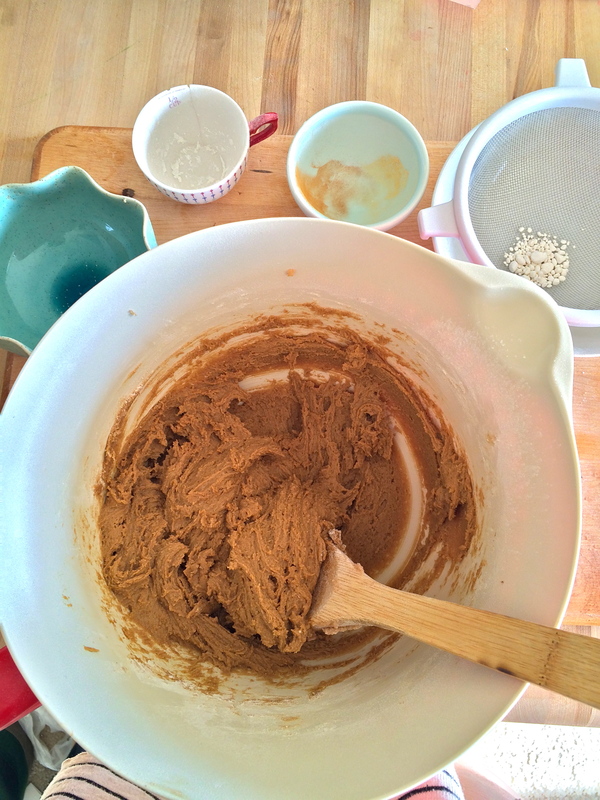 Stir just until combined – don’t overstir, or the cookies could become tough. You can advance to the next step here if you like, but I like to put the batter in the fridge for about 30 minutes, just to tighten up a bit. Preheat oven to 350 F. Line two baking sheets with parchment or baking mats. Set up a little station with your baking sheets, your cookie dough with spoons or a cookie dropper, and a little bowl full of the turbinado sugar. 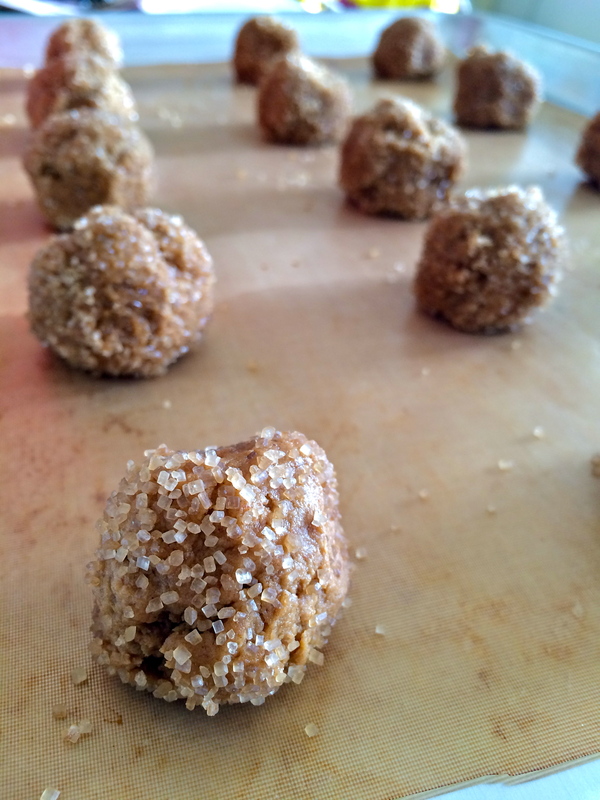 Scoop a small amount of dough, form it into a ball, and roll it in the turbinado sugar so that it’s completely coated. Place on the baking sheet and repeat with the rest of the dough. 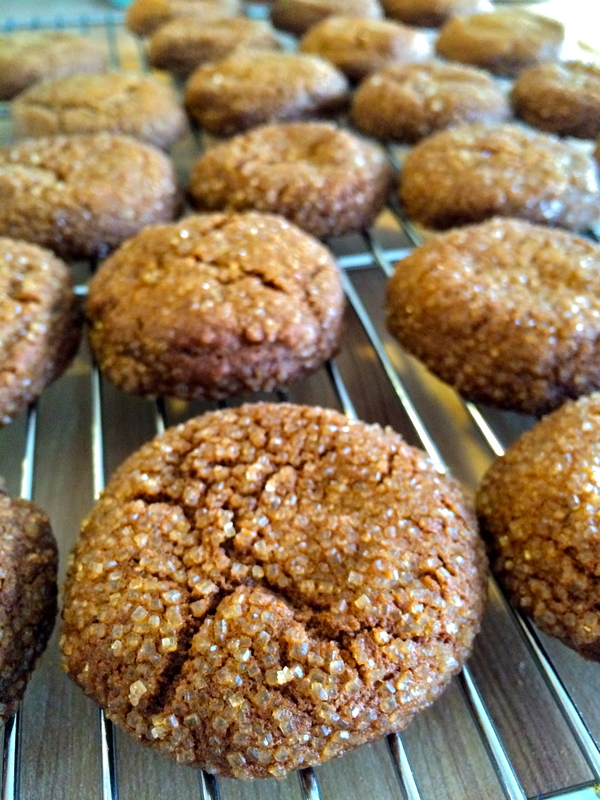 Bake for about 12 minutes, until the cookies are set but the very tops are still soft to the touch. Let cool for 2 minutes on cookie sheet and then move to a wire rack to cool completely. Put them on a plate and bring them to a friend before you eat all of them yourself. Happy fall!!! Just kidding. We’re not quite there yet. 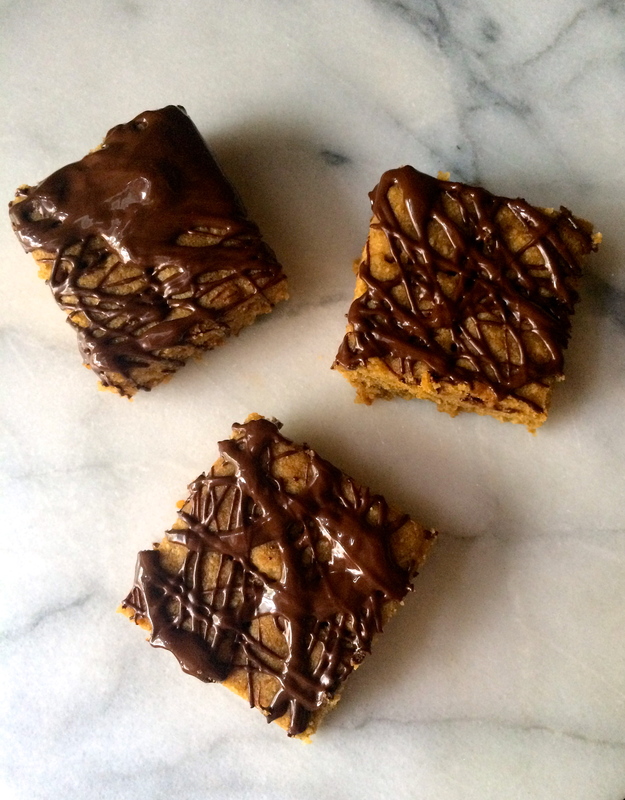 But that doesn’t mean we can’t bake something pumpkin-y. 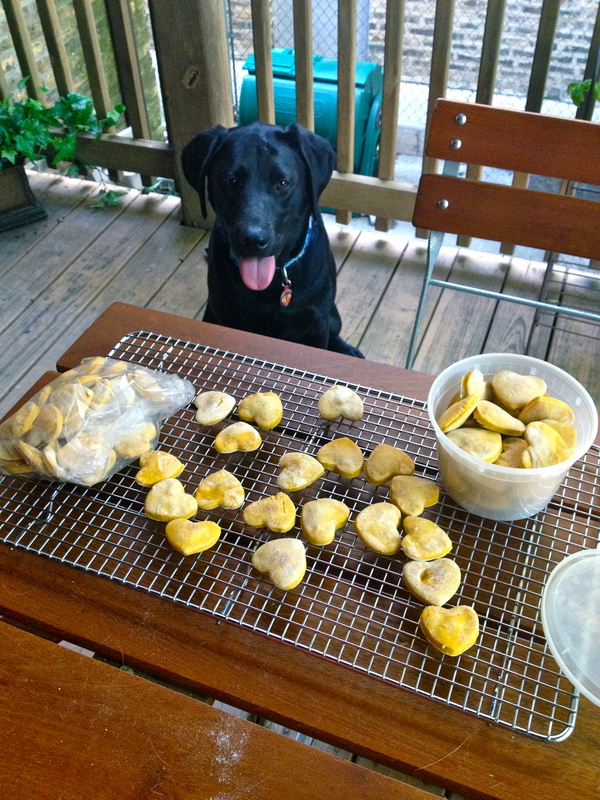 And pumpkin dog treats just felt right this weekend, since I was dog-sitting my family’s black lab, Peepers. Did you know that pumpkin is really good for doggy tummies? And that a lot of dogs really love the taste of pumpkin? That’s why this recipe is such a success – and not just with Peepers, who will eat literally anything. Peep has lots of dog friends who acted as my taste testers: a yellow lab, an American foxhound, and a vizsla with a sensitive stomach. I think I know a beagle who might appreciate them, too. The results: the labs and vizsla were bonkers for them, and the foxhound was funny – she carried a treat around in her mouth for a while before she finally ate it. One important note. You know your dog better than I do, so if he has a sensitive stomach or hasn’t tried anything like this before, give him one or two treats and then watch for any signs of upset, just to be safe. As for my taste testers, the canine verdict is good – my pup was breaking out all her tricks to get her paws on these pumpkin treats. Stir together pumpkin puree, peanut butter, and eggs. Add 1 cup flour, stir to incorporate, add the rest of the flour, and stir again. Lightly flour a flat surface. Take half the dough and use a rolling pin to roll it about 1/4 inch thick. 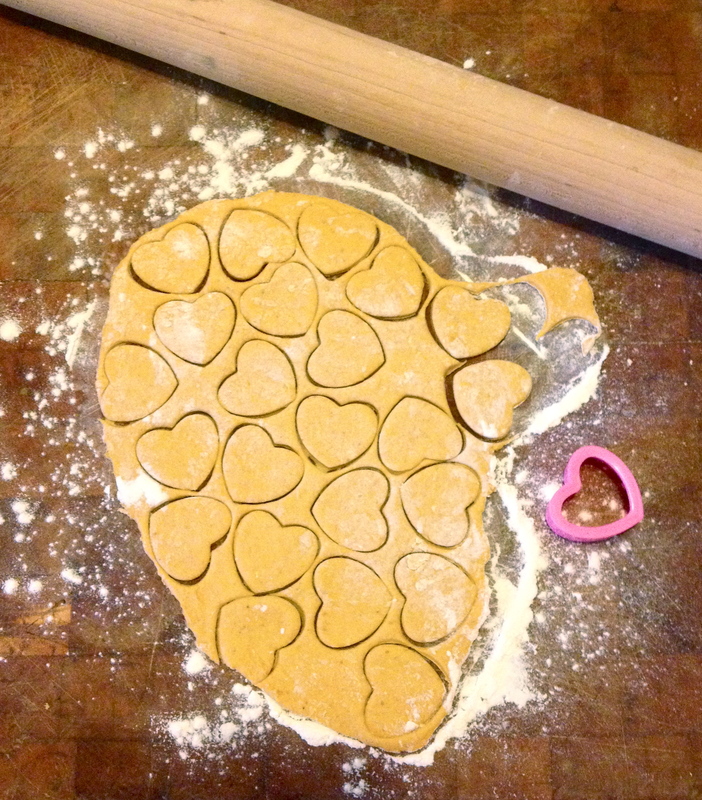 Use a cookie cutter to cut out the treats. 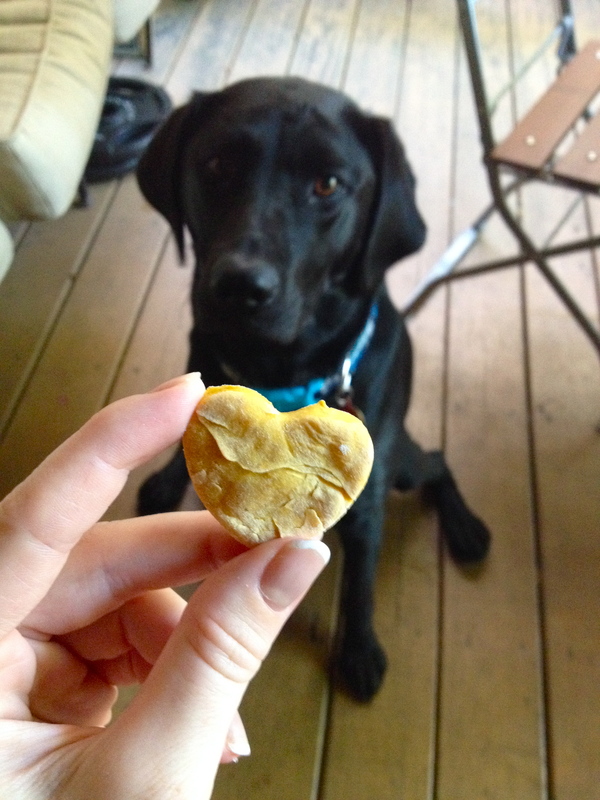 I used a heart, but honestly, your dog has no clue what shape they’re eating, so do whatever you want. Repeat with the rest of the dough until it’s all cookie-shaped. 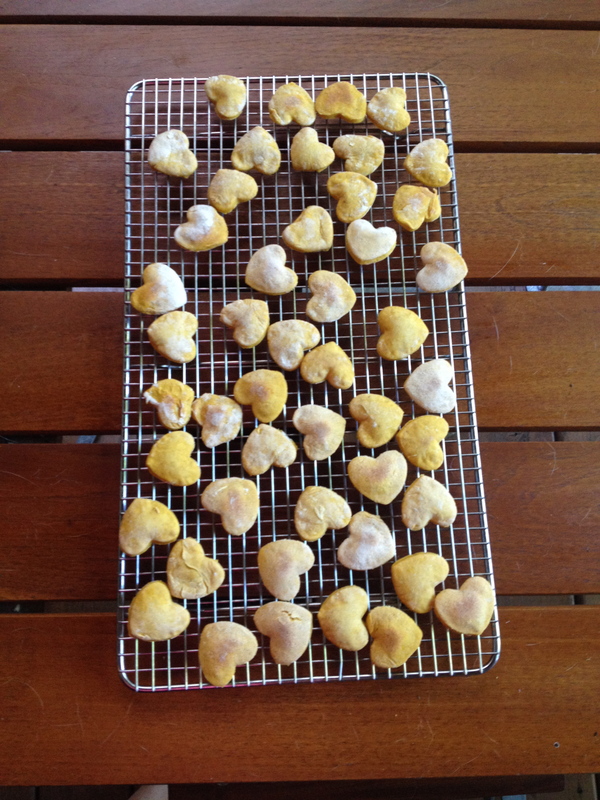 Lay the treats on a baking sheet (they don’t expand much, so feel free to crowd them on, as long as they’re not touching) and bake for 20-30 minutes. 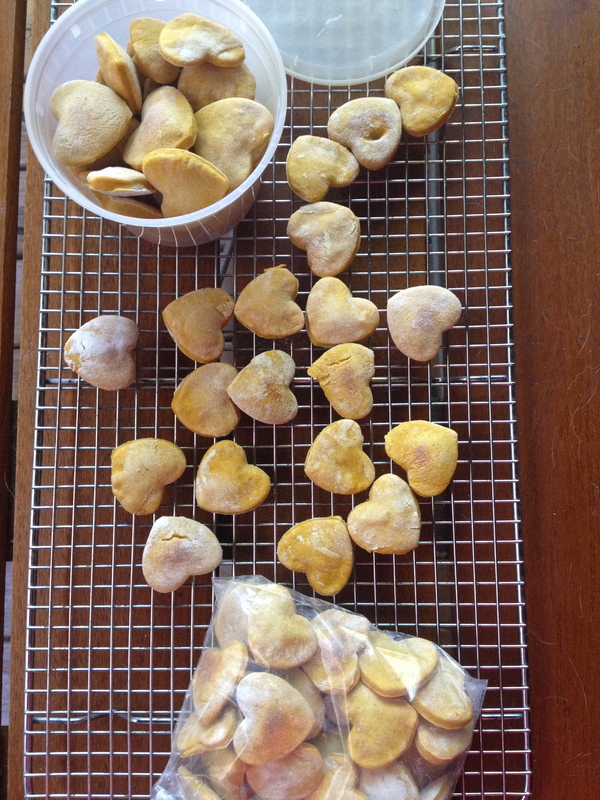 They do puff up in the oven, almost like a cute little pillow, so that the hearts are more 3D than flat. Let cool completely before putting them away. Peepers was suspicious of the treats at first – like, are you trying to make me eat something healthy?? – but once she had one, I could barely keep her away. Love her little face when she gets excited to eat another treat! S’mores with Homemade Spiced Graham Crackers. In a food processor, pulse together the almond meal, coconut flour, potato starch, baking powder, baking soda, cinnamon, ginger, and salt. Then add the maple syrup, molasses, butter, milk, and vanilla and pulse just until the dough comes together. If it’s looking too wet, add a bit of coconut flour and pulse again. Turn the dough out onto a sheet of parchment paper, press into a flat disc, and wrap in the parchment. Refrigerate for at least 30 minutes, or up to a few days. Preheat oven to 350 F. Remove the dough from the fridge and roll out to about 1/4 inch thickness. 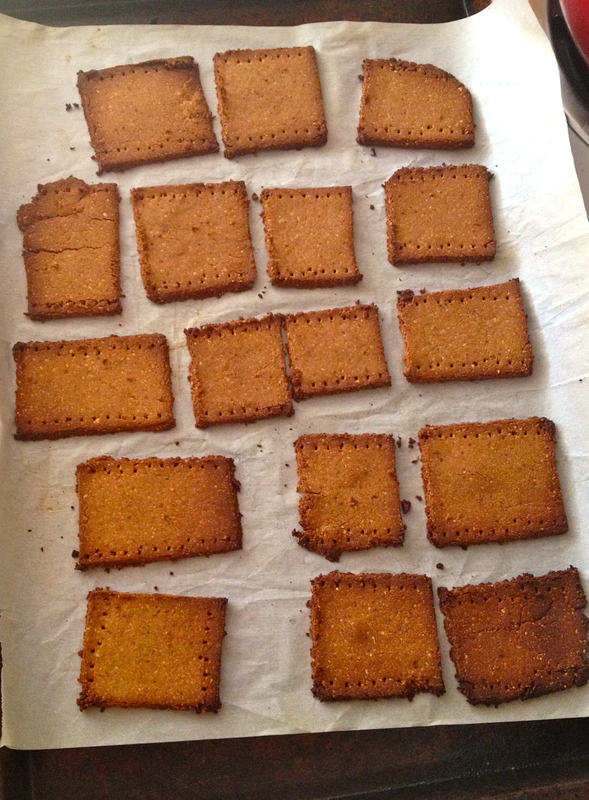 Cut into squares (or whatever shape you want) and lay flat on a parchment-lined baking sheet. If you like, use a fork to make some kind of cute little design. Bake for about 10 minutes, until the edges just start to brown. That’s it for the graham crackers! 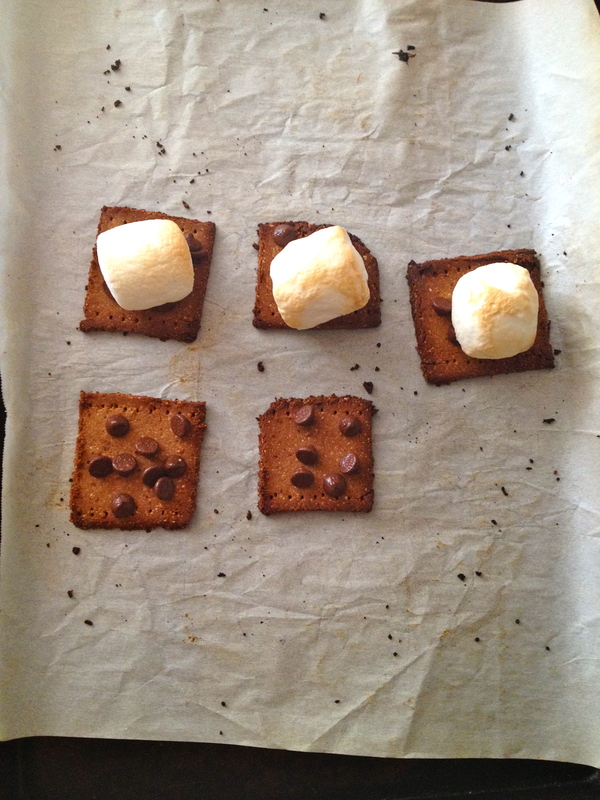 When you’re ready to make the s’mores (which, for me, was immediately), turn the oven up to 400 F. While it preheats, top the graham crackers with chocolate and add a marshmallow to each. 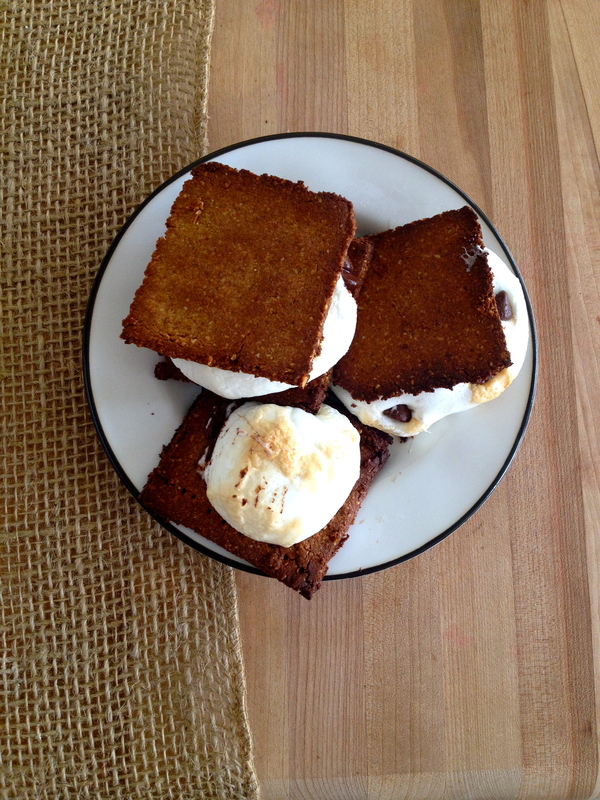 I tried sandwich s’mores and the open-faced kind, and open-faced is the way to go. 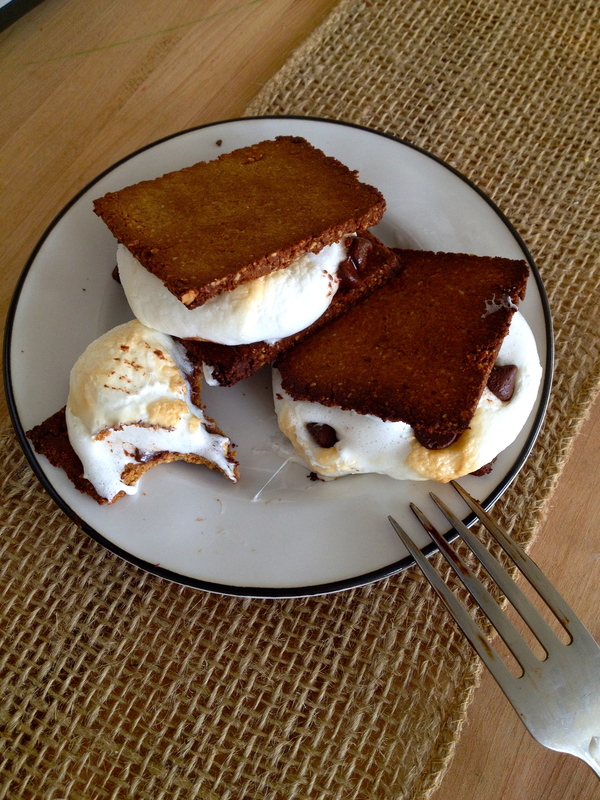 You get double the s’mores goods that way, and still all that toasty marshmallow on top. Pop them in the oven just for a minute or two, until the chocolate has melted and the marshmallows are lightly browned. That’s it! Keep the rest of the graham crackers in a sealed container and just repeat the melting process when you’re ready for another s’more. I put them in my cast iron skillet to toast in the oven, and maybe I’m imagining it, but they seem to toast up just perfectly this way.